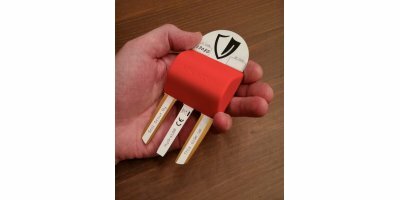 The Scout is a small, durable, wireless buried device. The Scout transmits small packets of data several feet below ground on either an hourly or every 20 minutes basis (by default), to an above ground Receiving Antenna. The HYDRA Scout measures temperature, salinity and moisture content, but we can integrate other sensors, including 3rd Party, combinations via FLEX Scout for custom projects. Receives the Scout transmission, and passes to the Base Station.The antenna choice (typically Yagi or Omni) depends on the specific needs of the installation. The Base Station receiver unpacks the compressed Scout packets, and passes them to a GSM/WCDMA Modem, which transmits the data to Cloud & Analytics. Each receiver can handle 1000+ Scouts. Typically pole or building mounted, it can be located up to 1km / 1000 yards away, depending on site-specific characteristics. Alternatively it can be pole-mounted on in-field irrigation equipment such as pivots or lateral move systems. The Base Station requires cellular coverage, and suitable data-enabled SIM card (not provided). Note that we currently do not support CDMA (Verizon). 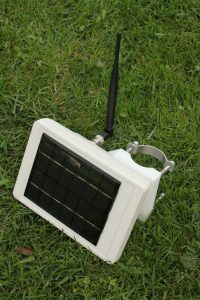 In situations where the Scout signals may be too far from the Base Station Receiving Antenna, or there are topographical or other barriers to line of sight transmission, one or more solar-powered ECHO Repeaters can be used to pass the signal along. Range up to 10km (6 miles), depending on Antenna type. By default, the ECHO comes with a stub antenna, but alternative antenna's, such as Omni or Yagi, can be used instead. 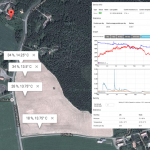 The Scout data is uploaded in real-time to the Soil Scout Analytics platform. Viewing is via a standard computer or mobile device web browser. The data can be visualised and analysed in multiple ways, including via a Map Overlay. The Analytics platform incorporates notification and alarm functionalities, and an optional API capability. See Analytics in the next section for more information. Soil Scout was initially developed with Agriculture in mind, and our current HYDRA100 Scout has integrated moisture, temperature and salinity sensors. Beyond Agriculture, multiple industry sectors are enjoying the benefits that the HYDRA100 Scout can deliver. Alternatively, we have the ability to integrate a variety of 3rd Party sensors as a custom project, assuming that they are able to operate under ground for extended periods. No reviews were found for HYDRA Scout - Wireless Buried Agriculture Monitoring Device. Be the first to review!